The YGN is the young members' branch of the Nuclear Institute. Members of the Nuclear Institute who are 36-years-old or under automatically join the YGN. The YGN has been in existence for 20 years and currently consists of over 660 members. The YGN benefits individuals and the wider industry through promoting communication, collaboration and professional development in this country and around the world. This year, the YGN is excited to launch Strategy2020! 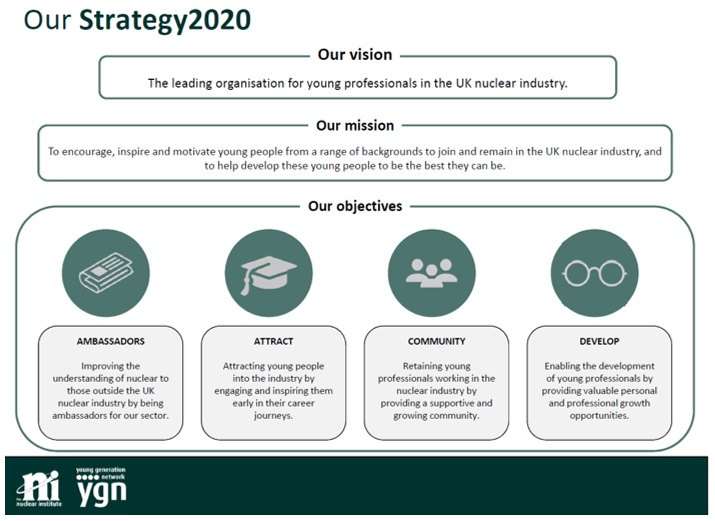 We’ve refreshed our vision, mission and objectives so we can continue to support and nurture the UK’s younger generation into becoming the world’s leading nuclear workforce. By encouraging our younger members to act as nuclear ambassadors, through attracting talented young people and by providing opportunities for professional growth, we aim to play a key role in building a nuclear sector that the UK as a whole can be proud of. If the YGN’s new strategy excites you too, why not get in touch to find out how you can help us accomplish our mission! Increase your knowledge of nuclear industry technologies, sectors and organisations. Develop competencies towards professional registration and recognition of your nuclear professionalism. Attend events and training programmes. Meet peers and expand your network. Develop a whole host of other skills including event organisation, business and financial management, marketing, coaching & mentoring. Develop the relationships that will shape the future of both your career and the industry. Development of staff through high value training and cross sector learning. Raise your company profile and its commitment to high standards of nuclear professional practice. Development of staff towards professional membership of the NI, including assessment against the Nuclear Delta® - the standard of professionalism in the nuclear sector. Supports future competitiveness through development of personal networks, capability and in-house expertise. Discounted attendance at our industry-renowned events. Nuclear Future journal sent to you in the post (bi-monthly). Access to the Nuclear Institute online portal (www.nuclearinst.com). Access to YGN volunteering opportunities & mentoring. Apply to have your nuclear professionalism recognised through professional membership of the Nuclear Institute and chartered status with the Engineering and Science Council. The YGN is run and delivered by a network of volunteers, and we are always looking out for more support. To find out more, get in touch at chair.ygn@nuclearinst.com and sign up to our monthly newsletter at www.nuclearinst.com. I look forward to meeting you all again throughout the year. Connect with us via social network on Twitter, Facebook and LinkedIn!"